Kotheid Nicoue is passionate about designing partnerships that leverage the resources of the private sector to build sustainable projects in communities around the world. 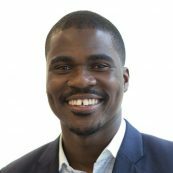 He works as a Senior Program Coordinator at PYXERA Global and manages global pro bono programs for multinational companies such as IBM and SAP in North and Sub-Saharan Africa. In this role, Kotheid works to build the capacity of social enterprises, government entities and non-profit organizations working in areas of technology, education, youth employment and empowerment, and community development. Kotheid joined the Center for Citizen Diplomacy division of PYXERA Global as a Research Intern in September 2012 after graduating from the University of Iowa with degrees in International Studies and French. As a native of Togo, Kotheid is fluent in three languages.